Anaïs Tondeur is an artist who delights in expeditions. Whether tracing the wildlife burgeoning in the exclusion zone around the Chernobyl nuclear plant (Chernobyl’s Herbarium, 2011), or following the migration of a graphite pencil from its geological origins to its unlikely terminus in the bladder of a 17-year-old girl (I.55, 2013), her journeys conjure intriguing narratives that are in turn poetic, poignant, and scientifically compelling. Her installations have delved into history, geography, and an array of scientific disciplines (physics, geology, oceanography), but at the heart of each is a captivating story that engages the most human of emotions. Nowhere is this truer than in ‘Lost in Fathoms’, Tondeur’s current solo show at GV Art, London. Not simply a story but a mystery, a whodunnit, even, ‘Lost in Fathoms’ tells of the mysterious disappearance of a volcanic island called Nuuk, formed at and then apparently lost in the nexus between the North American and Eurasian continental plates. The now-vanished Nuuk – the Greenlandic term for ‘promontory’ or ‘headland’ – is the springboard from which to explore the geological, environmental, and atmospheric forces that might have caused it to disappear. 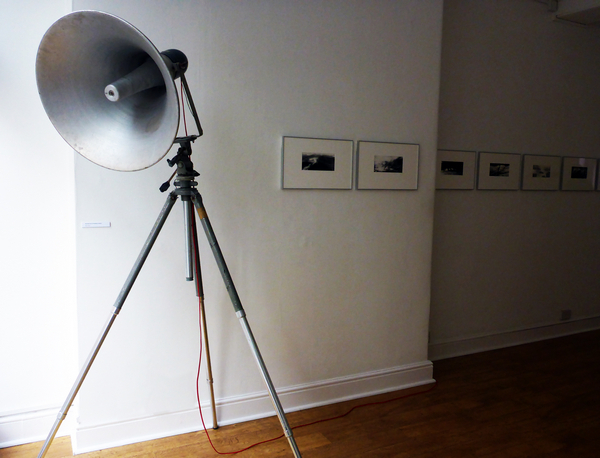 On entering the first gallery the visitor is immediately engaged by a large, old-fashioned and curiously anthropomorphic speaker. It is emitting strange crackling noises and seems to be trying to communicate, but in a language beyond our understanding. It is only after descending to the second, lower gallery (appropriately below ground) that the mystery of this message is revealed: the speaker is connected via a cable to an equally antiquated microphone descending from the ceiling and hovering above a piece of basalt rock on a plinth. Tondeur’s work relays the sound emitted by a piece of basalt (retrieved by the artist who dived into the fissure between the two tectonic plates) fracturing when it was subjected in a lab to the kind of environmental conditions that might have caused the island to fragment. In its ambition and execution the piece is typical of the works in the show: it brings an environmental event that materialises on a massive and imperceptible scale down to visible and graspable size. In the hypnotic video Singular Occurrence of a Fall, which reconstructs in slow motion the effects of an earthquake on the rock of an island, geological time and phenomena that would ordinarily be beyond human purview are brought into the confines of the gallery. The same can be said of the pelagic installations in the third gallery, concerned with the inconceivably colossal oceanographic phenomena that might also have contributed to Nuuk’s demise. Through the medium of a shadowgraph MOC Waterdive creates a visual analogy of a gravity wave in a ‘scaled down ocean’, mimicking the movement of deep oceanic currents. 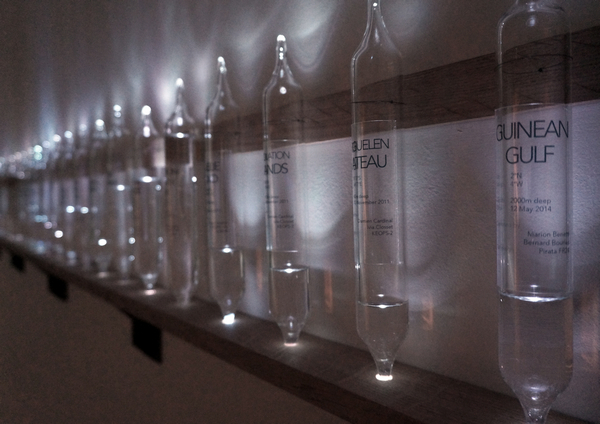 Meanwhile Encapsulated Ocean, a set of exquisitely lit phials containing water samples collected from across the world, represents not only scientific endeavours, but also the ‘memory’ of a notional journey travelled by a wave lapping at Nuuk’s shores. The theme of the archive, both scientific and touchingly personal, is even more pertinent to Memory of the Oceanographer, a set of water samples from the collection of Harry L. Bryden, still housed in their original 40-odd year old bottles with stained, faded hand-written labels. The mysteries of Nuuk’s disappearance multiply layer upon layer throughout the show. The beautiful, evocatively named shadowgrams, for example, beg all sorts of questions not only about their production (are they photographs? are they hand drawn?) but also about their apparent blurring of fact and fiction. ‘Lost in Fathoms’ is the product of an artistic residency at the Hydrodynamics Laboratory of the École Polytechnique (LadHyX) and in collaboration with Jean-Marc Chomaz, Director of Research at the National Centre for Scientific Research in France. Its scientific rigour and explorations of oceanographic and geological phenomena inevitably bring it into the ‘art/science’ realm, but it would be unjustly reductive to pigeonhole Tondeur’s work in any such category. 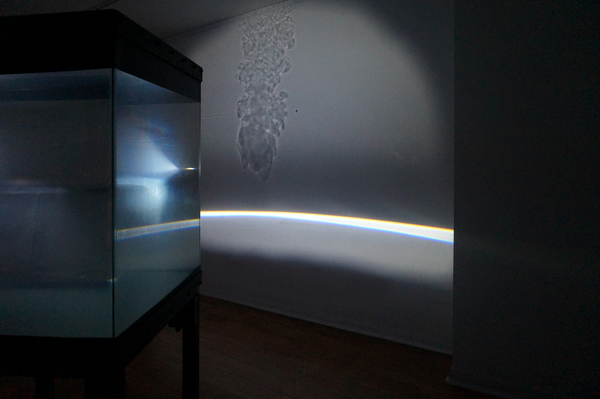 ‘Lost in Fathoms’ succeeds in dissolving the art/science border, creating a mysterious and lyrical journey tracing absence, memory and loss, whose poignant echoes reverberate through the protean depths of the ocean and the shifting strata of the earth. ‘Anaïs Tondeur: Lost in Fathoms’ is at GV Art London until 29 November.